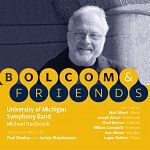 Each year, students and faculty of the School of Music, Theatre & Dance present more than 450 concerts, recitals, and staged performances in Ann Arbor. The schedule of concerts held by the School orchestras, bands, and choirs is augmented by numerous solo and small ensemble performances. Various ensembles specialize in early music, electronic music, contemporary classical music, jazz and improvisation, and many eclectic styles of music including Klezmer, mariachi, Japanese music, and Javanese gamelan.